I first discovered Barrydale Weavers products in a shop in Cape Town, while I was on an extended holiday to South Africa in Feb 2015. I have always loved woven fabrics and was drawn to the distinctive handmade look and feel. As I was staying in South Africa for a few months I decide to take a trip to Barrydale. Barrydale is located on the border of the Overberg and the Klein Karoo in the Western Cape. I drove up on a wonderful sunny day via the Tradouw Pass, which is a spectacular route through the Langeberg Mountains. Barrydale has a permanent population of just over 4000 people but this grows substantially in summer with the influx of tourists, many of whom stay in the well-known Karoo Arts Hotel in the centre of town. I met Carol Morris and Tivane Mavuma, who together are the driving force behind Barrydale Weavers. We went for coffee and for an hour they told me the inspiring story behind their business. It started over 30 years ago when Carol was looking for someone to hand weave fabrics. She was introduced to Tivane who lived in the Kingdom of Swaziland and wove fabrics on a handloom in his home. Tivane is originally from Mozambique and was trained by a German master weaver. He started to weave for Carol and as demand grew, Tivane bought more handlooms, with a loan from Carol and started to employ local people. This arrangement lasted happily over many years until Carol moved to Barrydale and persuaded Tivane to join her … and so in 2007 Barrydale Weavers was born. The business is located on Route 62 and is a great draw for visitors. 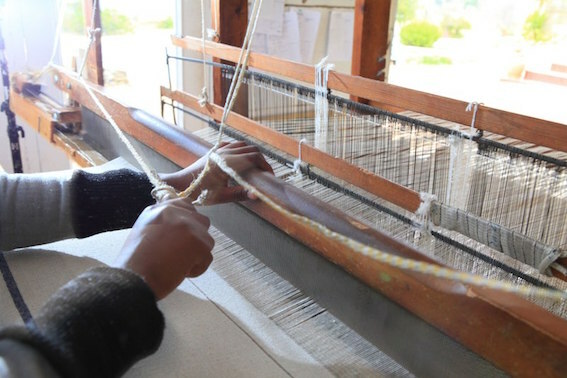 Barrydale Weavers today employs over 17 people using a range of handlooms, many of which have been donated by people who have been inspired by the story. Tivane builds the looms and trains local people to weave. As I walked through the premises after coffee, there was the great sound of handlooms in action, as Tivane was building a new loom that had just arrived. 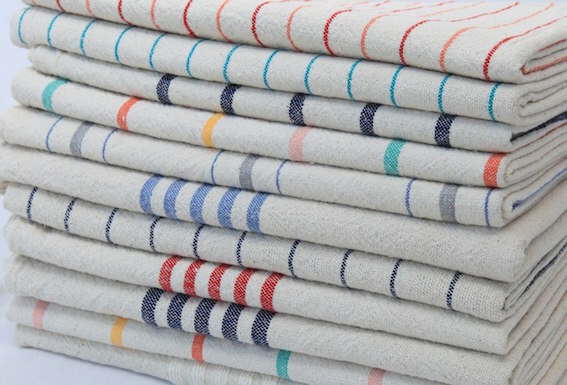 The main focus of Barrydale Weavers is on homewares including tablecloths, tea towels, bedspreads and rugs. The distinctive style of the finished items is achieved by weaving natural unbleached cotton on traditional handlooms to achieve a very individual handmade look and feel. The business has been so successful that an additional premises has recently been acquired to focus on rug weaving. The Barrydale Weavers story is an inspiring one. For me it’s about a passion for producing beautiful hand woven fabric, it’s about the employment and training of local people … and it’s about ensuring the wonderful craft of hand weaving lives on in a community. Thanks to Carol Morris and Tivane Mavuma for telling the story of Barrydale Weavers. 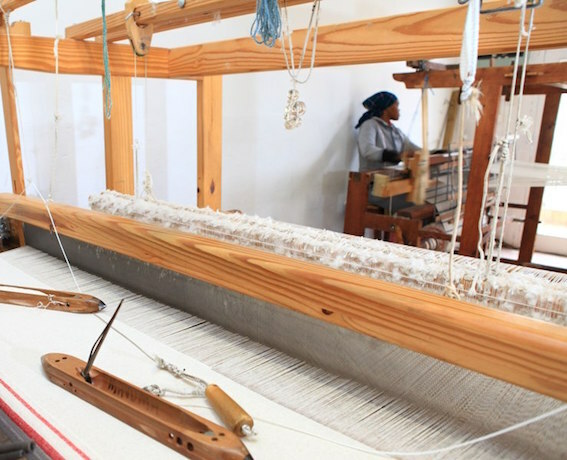 Find out more about Barrydale Weavers here. Images courtesy of Barrydale Weavers.